TORONTO — Michael Hutchinson was introduced to his head coach and teammates a few hours before making his Toronto Maple Leafs' debut. With No. 1 goalie Frederik Andersen and backup Garret Sparks out injured, the 28-year-old from nearby Barrie, Ont., got a big cheer from the crowd when he was introduced, made some nice saves, and watched Toronto jump out to an early lead. There would, however, be no storybook ending Thursday. 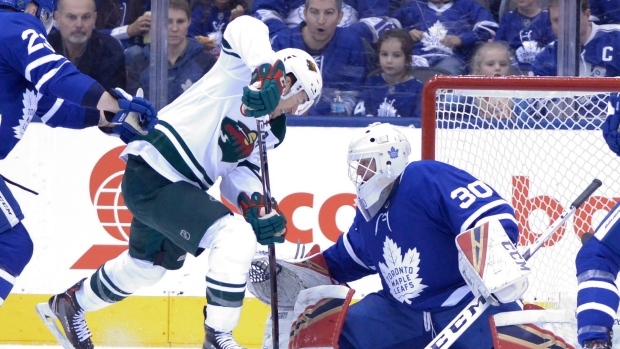 Zach Parise scored the winner and Devan Dubnyk made 38 saves as the Minnesota Wild fought back from deficits of 2-0 and 3-2 to down the Leafs 4-3 in a rare weekday afternoon game. Acquired from the Florida Panthers on Saturday to provide the organization some goaltending depth, Hutchinson was recalled from the AHL's Toronto Marlies on an emergency basis with both Andersen (groin) and Sparks (concussion protocol) ruled out. "It was a little bit hectic. I found out last night," said Hutchinson, who made 30 saves, including 18 in the first period. "Things moved pretty fast." Andersen is on injured reserve, while Sparks, who took a shot up high in Wednesday's practice after starting Toronto's last three games, sat out for precautionary reasons. Kasimir Kaskisuo was also recalled from the Marlies to serve as Hutchinson's backup against Minnesota. Leafs head coach Mike Babcock said Andersen skated on Thursday, but the status of both NHL netminders remains up in the air, meaning Hutchinson could get the call again Saturday when Toronto hosts the Vancouver Canucks. "You get traded here and hope you get a chance to play for the Leafs, growing up just north of here," said Hutchinson, who cost Toronto a 2020 fifth-round draft pick. "It was really exciting to get my first game under me, but it also makes you hungry to get more and to get the first win and go from there." Jared Spurgeon, with a goal and two assists, Charlie Coyle, with a goal and an assist, and Mikko Koivu provided the rest of the offence for Minnesota (19-17-3). Parise also had an assist. "We kept pushing even when they got the 3-2 (lead)," said Dubnyk, who was named to his third all-star game Wednesday. "We just stuck with it." The Wild came in 1-5-1 over their last seven, with just 10 goals over that snap. Mitch Marner, with two inside the game's first six minutes, and William Nylander had the goals for Toronto (26-12-2). John Tavares added two assists as the Leafs dropped their second straight game following Saturday's listless 4-0 loss to the New York Islanders that snapped a five-game winning streak. "We scored twice in the first period ... I didn't like our first period," Babcock said. "They were better than us. "After that I liked our game a lot." The 2 p.m. ET matchup was dubbed by the Leafs as their "Next Generation Game" — one aimed at celebrating youth and encouraging the next generation of hockey fans. Parise took advantage of a turnover by one of Toronto's young stars, Auston Matthews, at 4:21 of the third and beat Hutchinson upstairs for his 18th to give Minnesota its first lead. Toronto got two power plays after the Wild pushed ahead — Matthews hit the post on the Leafs' best chance — but wound up 0 for 4 with the man advantage. "You've got to learn how to win all kinds of games," Babcock said. "They're a veteran team, they make it hard on you." There were even miniature versions of Babcock and famed commentator Don Cherry. Marner gave them all something to cheer about right out of the gate when he scored after just seven seconds to tie a franchise record for the fastest goal at the start of a game. The 21-year-old winger, who was denied an all-star nod despite sitting sixth in league scoring, made it 2-0 with his 15th goal, and ninth in the last eight games, at 5:38 on a give-and-go with Tavares. Coyle cut the deficit to 2-1 at 9:10 on Hutchinson, who was still sporting his Panthers gear, with his seventh. Minnesota got even at 5:09 of the second when Koivu swatted home his sixth, but Nylander replied with his first at 8:16. The winger had just two assists in his 11 previous games since his contract impasse with the Leafs ended on Dec. 1 with a six-year, US$45-million agreement. Parise hit the crossbar moments later, but the Wild got back on level terms again at 9:36 when Spurgeon was given all day to pick his spot on Hutchinson for his fifth before Parise won it. "It was a fun game to be a part of," Hutchinson said. "It was unfortunate we weren't able to get two points or score late and push it to overtime." He could very well get another chance Saturday night. Notes: Marner's goal seven seconds into the game tied Charlie Conacher's team record set on Feb. 6, 1932. ... Hutchinson was 1-1-2 with an .839 save percentage and a 4.18 goals-against average for the Panthers this season, but a respectable 43-39-11 with a .910 save percentage and a 2.65 GAA in 102 games between 2013 and 2018 with Winnipeg. ... Tavares and Matthews were named as Toronto's all-star game representatives.